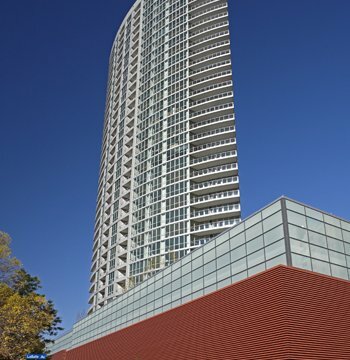 Metal Sales Manufacturing Corp. recently provided more than 13,000 square feet of its TDR-6 deep-ribbed metal wall panels for Minneapolis' tallest apartment tower, known as LPM. The Loring Park area of the city has become the go-to destination for many young adults and professionals, due to its proximity to downtown Minneapolis, affordable prices and amenities like coffee shops and restaurants. The neighborhood has grown in recent years, making it an ideal location for LPM. LPM developer, Magellan Development Group, began visualized a luxury apartment highrise befitting the surrounding area, according to a release from Metal Sales. The developer and architect had a specific design in mind for what is now the tallest apartment tower in downtown Minneapolis. The main portion of the 36-floor structure is curved on both faces with only two corners, one on each side where the faces meet. From above, the shape is similar to an oval pointed at both ends. The base of the tower is a five-story podium that contains a public parking garage and space for commercial build-outs. The project team had a specific aesthetic in mind for the podium and turned to Metal Sales to achieve the desired look. More than 13,000 square feet of Metal Sales 22-gauge exposed fastened TDR-6 deep ribbed metal wall panels with mitered corners are installed horizontally on three elevations of the podium. The panels give the podium a beautifully sleek appearance for the blue-glassed tower to rest upon. Metal Sales panels have a long life span, are 100 percent recyclable and contain a high percentage of recycled material, contributing to sustainable building goals, such as LEED. All standard panel colors are Energy Star listed and can improve the energy efficiency of a building. Color choice was a key feature in the architectural design of the metal panels surrounding the podium. The designers worked closely with Metal Sales to get the exact color envisioned for the project. Metal Sales provided the team with metal panels finished with a custom PVDF paint in a striking California Redwood color. LPM was designed to achieve LEED silver certification from the U.S. Green Building Counsel (USGBC).